The Antique Motorcycle Club of America holds a vintage motorcycle festival each summer in the rural community of Rhinebeck, New York. A two-hour ride north of Manhattan takes you to this quiet and beautiful area, with Catskill Reserve, a large state park just west of the Hudson River, quite nearby. The Reserve has light traffic and smooth roads, which wind through mountains and follow rivers. As we entered the Duchess County Fairgrounds for the 2017 gathering, a motorcycle, long and brown, whirred quietly by. My buddy Doug and I exclaimed, “What was that?” This became our catch phrase for the next two days. 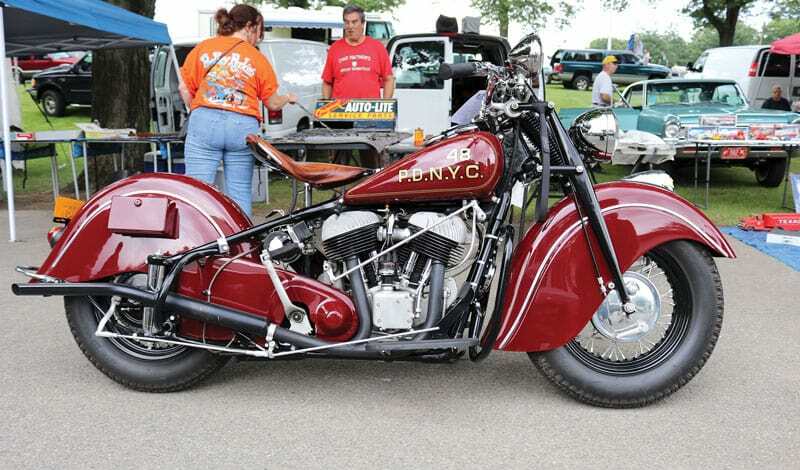 We looked at beautiful and unusual parts on vendors’ tables and viewed unfamiliar motorcycles and contraptions on wheels. We watched with delight as two fellows from Boston pushed carts full of cherished parts, and I laughed as a man maneuvered a complete motorcycle front end across the field, arms outstretched comically as if operating a lawnmower. Program organizer Don Spence and chapter president Keith “Mudfish” Moser told us they like to maintain a family-friendly festival. The atmosphere is open, lighthearted and fun, and it has a food court and nice people like first responder Linsey Henrique, who works the first-aid station. Many of the sponsors who made the event possible were on hand as well, including Motorcyclepedia, Woodstock Harley-Davidson, Indian Motorcycles of Springfield, Massachusetts, Indian Motorcycles of Brookfield, Connecticut, and Spectro Oil. Beautifully restored early motorcycles from the teens through the 1950s were displayed in the large buildings. British and Japanese stock and period-correct customs from the ’60s and ’70s competed, choppers and hot rod cars brought back memories and the all-female Motor Maids club was even on hand. Founded in 1940, Motor Maids has several members in their 90s, and meets are staged at different locations throughout America each year. Club members must ride their motorcycles to the meet…no trailering. On our journey to Rhinebeck, Doug and I met two Motor Maids who were riding from Ontario, Canada, to a meet in Indiana! The heart of the festival takes place outside on the fairgrounds. Here history moves into the present tense. Vintage bikes fire to life and cruise the grounds. Motorcyclists ride in for the day on Vincent Black Shadows and 1934 Morgan three-wheelers. Others brought vintage motorcycles aboard restored vintage trucks. Astounding! The patina of many of the riders matched that of their bikes, too. Vintage Nortons, Indians, Harleys and Hendersons cruised by—rider and machine metered and rhymed. Some folks attend the event to show or sell their bikes; others attend to sell vintage parts, perhaps the bones of someone’s new project or precious parts needed to complete a current one. We located the mystery bike that whirred past earlier. It was an in-line 4-cylinder, 1,147 cc, 14.2-horsepower 1919 Henderson with an exposed valve train. The bike had sat in the owner’s barn in New Hampshire for 15 years awaiting completion. His friend said that the owner was fortunate to complete his project in such a “brief” time span—many collectors never complete their restorations because much-needed parts can’t be located. On the last day of the festival Doug and I watched as young children were given rides in sidecars or on trikes. The most heartwarming and hopeful event took place during the judging of the Japanese motorcycles. Sixteen-year-old Mason Thyng had restored a 1970 Yamaha two-stroke to original order. Mason’s father had brought the bike home after finding it in a barn near their home in New Hampshire. He wanted his then 14-year-old son to restore the bike on his own. Mason researched, studied, wrenched and polished the little blue-and-white Yamaha to perfection. At the judging, senior judge “Flathead Jack” questioned young Mason about his entry. Realizing immediately that the young lad knew volumes about 1970s motorcycles, he placed an orange judge’s vest on the young boy and pronounced him Assistant Judge! Perhaps the next time we attend a vintage motorcycle festival and exclaim, “What was that?” a young Mason Thyng will politely step up and answer our question. So, what is the date of this event? This event is usually late June or early July. I would check the website antiquemotorcycle.org a month or two before then in 2019 to get the dates for next years event. The fairgrounds and upstate New York are absolutely stunning at that time of the year. I would highly recommend you to try attending.